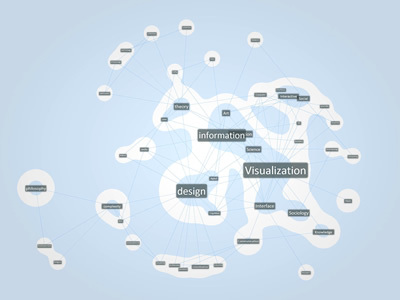 Knowledge Cartography is part of a PhD research on the visual representation of knowledge. The aim of the research is to extend the cartographic metaphor beyond visual analogy, and to expose it as a narrative model and tool to intervene in complex, heterogeneous, dynamic realities, just like those of human geography. The map is thus not only a passive representation of reality but a tool for the production of meaning. Just like a text, the map makes selections on reality, distorts events, classifies and clarifies the world in order to selections better tell a particular aspect of a territory, an event, a space. The images shown here are screenshots taken from ATLAS, the application that's being developed to explore the possibilities of the application of a cartographic metaphor to the realms of knowledge. 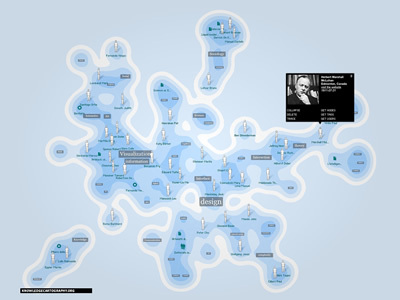 The concept of ATLAS in this context doesn't only depict a list of maps, but rather a system of representations of space, a communication device aimed at representing complex contexts through the use of many partial overlapping narrations: a network of maps, diagrams, texts and peritexts, combined together to describe the space of research in its multifaceted aspects.